At the Schedule step of the wizard, specify the schedule according to which backup must be performed. Everyday — select this option to start the job at the specified time daily. On week-days — select this option to start the job at the specified time on week-days. On these days — select this option to start the job at the specified time on selected days. You can leave the Daily at check box cleared to configure the backup job without daily schedule. In this case, you will be able to use the configured backup job to perform backup automatically at specific events. You can also use the configured backup job to create ad-hoc incremental and standalone full backups. For details, see Performing Ad-Hoc Backups. If you have selected the On these days option, click the Days button and clear check boxes for the days when the job must not start. 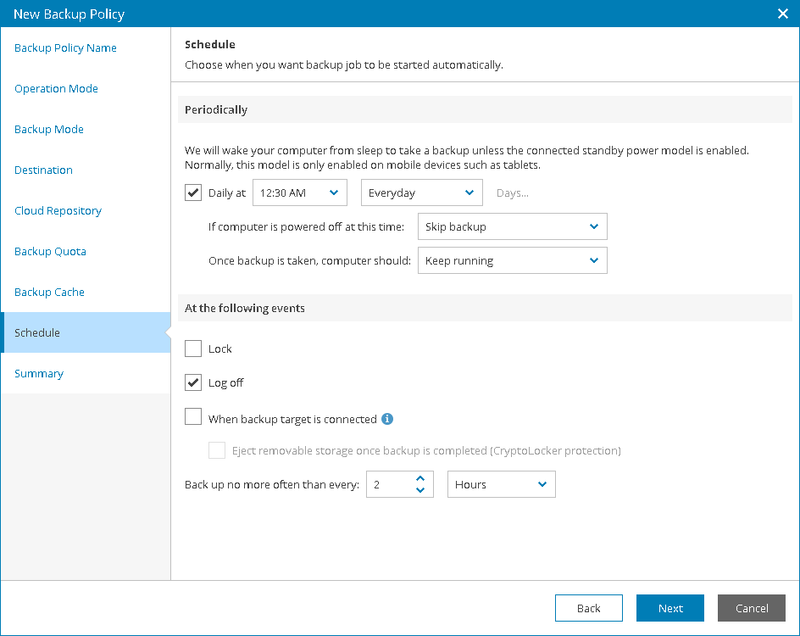 Backup once powered on — select this option if Veeam backup agent must start the scheduled backup job when you power on the computer. Skip backup — select this option if Veeam backup agent must not to start the scheduled backup job when the computer is powered on. Veeam backup agent will perform backup at the next scheduled time. Keep running — select this option if the computer must keep on working. Sleep — select this option if Veeam backup agent must bring the computer to the standby mode. Shutdown — select this option if Veeam backup agent must shut down the computer. Hibernate — select this option if Veeam backup agent must bring the computer to the hibernate mode. This option is available if the hibernate mode is enabled on the computer. For details, see https://support.microsoft.com/en-us/kb/920730. Veeam backup agent applies this setting only to scheduled backups. If you start standalone full backup or incremental backup manually, Veeam backup agent will ignore this setting, and the computer will not be shut down or brought to the standby mode when the backup job completes. When the backup job completes, Veeam backup agent will prompt a dialog with a countdown to the selected post-job action. You can select to proceed to the action immediately or to cancel the action. For details, see Controlling Backup Post-Job Action. Select the Lock check box if the scheduled backup job must when the user locks the computer. Select the Log off check box if the scheduled backup job must start when the user working with the computer performs a logout operation. Select the When backup target is connected check box if the scheduled backup job must start when the backup storage becomes available (for example, when the computer connects to a local network and the target shared folder is accessible). Select the Eject removable storage once backup is completed check box if Veeam backup agent must unmount the storage device after the backup job completes successfully. With this option selected, backup files on the removable storage will be protected from encrypting ransomware, such as CryptoLocker. Use the Back up no more often than every <N> <time units> field to restrict the frequency of backup job sessions. Specify a minutely, hourly or daily interval between the backup job sessions. The Back up no more often than every <N> <time units> option is applied only to job sessions started at specific events. Daily backups are performed according to defined schedule regardless of the time interval specified for this setting. If the power scheme on the endpoint does not allow using wake up timers, you can manually change the power scheme settings on the endpoint. To do this, navigate to Control Panel > All Control Panel Items > Power Options > Edit Plan Settings. At the Schedule step of the wizard, select to run the backup job manually or schedule the job to run on a regular basis. Select the Run the job automatically check box. If this check box is not selected, you will have to start the backup job manually to create backup. To run the job at specific time daily, on defined week days or with specific periodicity, select Daily at this time. Use the fields on the right to configure the necessary schedule. To run the job once a month on specific days, select Monthly at this time. Use the fields on the right to configure the necessary schedule. To run the job repeatedly throughout a day with a specific time interval, select Periodically every. In the field on the right, select the necessary time unit: Hours or Minutes. Click Schedule and use the time table to define the permitted time window for the job. Veeam backup agent always starts counting defined intervals from 12:00 AM. For example, if you configure to run a job with a 4-hour interval, the job will start at 12:00 AM, 4:00 AM, 8:00 AM, 12:00 PM, 4:00 PM and so on. If you define permitted hours for the job, after the denied interval is over, Veeam backup agent will immediately start the job and then run the job by the defined schedule. For example, you have configured a job to run with a 2-hour interval and defined permitted hours from 9:00 AM to 5:00 PM. According to the rules above, the job will first run at 9:00 AM, when the denied period is over. After that, the job will run at 10:00 AM, 12:00 PM, 2:00 PM and 4:00 PM. To run the job continuously, select the Periodically every option and choose Continuously from the list on the right. A new backup job session will start as soon as the previous backup job session finishes. In the Automatic retry section, define whether Veeam backup agent must attempt to run the backup job again if the job fails for some reason. Type the number of attempts to run the job and define time intervals between them. If you select continuous backup, Veeam backup agent will retry the job for the defined number of times without any time intervals between the job runs. In the Backup window section, define the time interval within which the backup job must complete. The backup window prevents the job from overlapping with production hours and ensures that the job does not impact performance of your server. Select the Terminate job if it exceeds allowed backup window check box and click Window. In the Select time periods window, define the allowed hours and prohibited hours for backup. If the job exceeds the allowed window, it will be automatically terminated.